Strobridge Elementary School in Hayward held a “Safety Day” on June 8, at which students received books and raffle tickets in exchange for their toy guns. School principal Charles Hill, who created the program, said toy guns teach kids not to take real guns seriously. “Playing with toy guns, saying ‘I’m going to shoot you,’ desensitizes them, so as they get older, it’s easier for them to use a real gun,” Hill told the San Jose Mercury News. Advocates of the right to carry firearms disagreed. “Having a group of children playing cops and robbers or cowboys and Indians is a normal part of growing up,” said spokesman for Responsible Citizens of California Yih-Chau Chang. The school safety day also included fingerprinting and photographing of children for the purpose of creating missing child CDs that parents could have in case their kids disappear. If the children of America are programed to believe that guns are evil and should be “turned in”…whom will fight all of the wars our progressive politicians get us involved in? Maybe because of Fast and Furious the Mexican people can fight them for us. Or Al Qaeda who we armed in Libya and are arming in Syria… but fighting in Afghanistan and Iraq. Awesome foreign policy. I guess there’s too much work to research all that and have it in the news besides all the government spying and corruption. So much work for journalists… where are they? In public relations selling us more crap or trying not to annoy the advertisers. I am bothered as much by the fingerprinting and photographing of children (assuming it is mandatory) than by the toy gun “buyback” (assuming it is not mandatory.) I have no problem with parents doing the fingerprinting and photographing for the same reason but I am getting tired of governments’ constant, “preventative” intrusions into personal privacy. I realize that this has been going on for some time but it is another area that we need to fight back against. Then the Common Core State Standards that is infecting our education systems should scare the hell out of you by how much data they collect, store and share. The federal (and now state) privacy laws had to be amended so as not to be clearly violated by what they’re planning on doing with our kids. Common Core is not collecting kid’s fingerprints. And you say privacy laws were weekend just for common core? Stringing together some fear memes don’t make them true. What specific data is it that the Common Core State Standards collects? I don’t know a lot about it but I would imagine that it tags individual students academic achievements and difficulties for reference at a later date. This would be the modern version of the infamous “permanent record” with which we were threatened as youngsters when we didn’t meet expectations. I don’t particularly like it but I don’t see how it is any worse than the old systems except for ease of accessibility. For parents who are concerned about their kids future rights and privacy, the public school system should probably be avoided if at all possible. Don’t worry after they get rid of the guns for prizes they will go home and use sticks as guns. You can’t stop the kids from wanting to get the bad guys. At least they are not taking knives and such from the kids. Or big books, or limbs, or rabid dogs or grouchy people, or mean coaches or social workers. (sorry I had a problem with a social worker the other day). What a load of bull pucky! 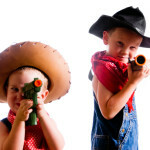 when I grew up we all played cops and robbers, cowboys and indians, etc. and I don’t know anyone who shot anybody ever. This is why I insist my kids don’t “play” with guns. I give them the REAL DEAL, and we shoot. Real guns. Real bullets. I agree with you 100 percent, no toy guns when there is the real thing! But, when do you move up to the heavy iron? I ask you this because your “”plink-plink” infers small rounds, like the wussy .22 caliber. When do they move up to at least a 45 or 44 magnum round and guns for some real action that will give a KABLAM instead of a plink?! One may “plink” with most any pistol. I’ve plinked with my 9mm and .45cal (as have my kids). We shoot the heavy steel @400yds+ with my heavier stuff. However, I am a tightwad and buy my ammo cheap, resell it at high – so it’s .22’s for a while (what with ammo prices and scarcity what they are). Am I profiting off of government corruption and stupidity (with some ammo manufacturer collusion thrown in)? You bet! Woo-hoo! Plus, my wife likes it when cases of ammo are sold (and removed from my secured storage facility).